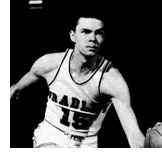 Paul Unruh, Bradley University's first All American basketball player, played with the Braves from 1946-1950 and helped his team win 112 games out of 135 during that time. A tremendous all around player, Unruh will be best known for his scoring ability as he tallied 1,822 career points which is still good for the third place on the all-time BU scoring list. Unruh, who prepped at Toulon High School, is still the only player in Bradley's history to lead the team in scoring four consecutive seasons. During the 1949-50 season he scored 475 points and led the Braves to second place finishes in both the NCAA and NIT tournaments a team feat that has never and will never be duplicated. That team was ranked number one in the nation for the major portion of the season. A good defensive player and tough rebounder in his day, Unruh held the record for freshman points (383) for 32 years before current Brave Mitchell "J.J." Anderson broke it in 1979. He has remained active in the Bradley athletic program and has served as President of the Chiefs' Club. Isaacson, Tom Cassidy, Bob Wyss, Greg Hasty, Al Hodson, Tim Marks, Bob Navarro, Bob White, Bob Nelson, batboy Tom Stonebock, manager Greg Leitner, student coach Bill Hill. LEGENDARY Manual baseball coach Ed Stonebock, who won his first state high school title with his unbeaten 1950 team, won No. 2 in 1965 with a team that started the season with 14 straight wins before bowing. 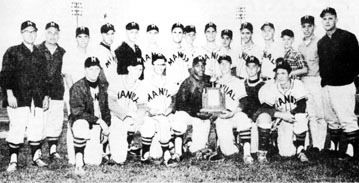 Led by outstanding pitcher and hitter Al Smith, who went on to an outstanding Bradley and professional basketball career, Manual moved into the state finals with a 19-3 record and then whipped Chicago Lane Tech 3-0, Decatur MacArthur 9-I and Arlington Heights St. Viator 4-2 to win its state title. Smith pitched Game 1, a 12-inning affair; Tom Casidy hurled the Rams to their semi-final win and Tim Marks, who had pitched just 17 innings all season, halted St. Viator in the title game on just three hits. The three held the opposition to an .098 bat mark. Smith was the tournament's most valuable player and with Marks made the all-tourney team. Smith, Marks, Cassidy and Bob Nelson won all-conference honors. For the season Smith led the team in home runs (3), RBls (23), hits (33) and runs (28). He hit .493 and was 8-1 on the mound. Marks batted .438 with 21 RBIs and 8 triples. Jim Anderson hit .360; Nelson, later to coach the Rams, batted .347 with nine doubles; and Larry Davis had 20 RBIs with six triples.